Throughout a full day of speakers and workshops, we explored the theme of Rise which focused on how women grow powerful by acknowledging individual successes and building up the collective. We got a taste of what lay ahead when Ngunnawal Elder, Aunty Violet used her Welcome to Country to remind us all that “we can be powerful together, if we support each other”. Our MC for the day, Meschel Laurie followed Aunty Violet and reminded us all of how we shouldn’t just be good women, but rather women who celebrate our sisters’ successes, are motivated by progressive values and build up women who will continue in our footsteps. Media Identity and first keynote speaker, Jamila Rizvi took the stage and urged us to stop referring to our successes as being grounded in luck. Luck, Jamila claimed, diminishes the hard work that goes into building success and deprives other women from following in our footsteps. And now that I think about it, it’s true! How often do we hear ourselves habitually referring to being in the right place at the right time as the foundation of our success? We got straight into the first of our panel conversations after morning tea, with Leading and Lifting, facilitated by founding editor of Women’s Agenda, Angela Priestley, and featuring Dr Vanessa Lee, Natalie Walker, Bridget Clinch and Dr Raji Ambikairajah. The audience heard how each panelist disrupted discriminatory status quos so the pathway for those who followed was that little bit easier. Bridget talked about her gender transition whilst still a solider in the Australian Defence Force and how she dismantled their pre-existing policies. Dr Lee didn’t hold back when she said “there is no blueprint for leadership … if you build a wall, I’m going to blow it up and walk through it”. Natalie Walker gave some workplace advice when she told us to amplify each other in meetings and stop letting the men at the meeting take credit for ideas presented by women (known as manproporiation). And Dr Ambikairajah, who from an early age wanted to be a tech industry CEO, said that the key to being a great leader and affecting disruptive change is the ability to listen to those around you, including junior staff. Next up we heard from Nas Campanella, a woman whose voice would be familiar to those who regularly tune into ABC Radio and Triple J. And while Nas’s enunciation was on display, so too was her story of overcoming prejudice in her early education and career because of her vision impairment. She played an audio file of the text reading software she listens to while simultaneously reading the news live on radio. The audience’s reaction was audible. Most poignantly though, Nas left us with her take on Rise; “I’ve had incredible mentors through my life. What makes a good mentor, makes a good leader … and in turn I’ve become a mentor to others”. After our breakout seminars focusing on practical career advice, Michele Fonseca took over to facilitate our second panel on “Creating structural change to rise”. Panelists Vanessa Patterson from the Workplace Gender Equality Agency, Professor Marian Sawer, Dr Jessa Rogers and Corporal Laura Power from the Defence Force Recruiting lead us through strategies on how to overcome longstanding sexist structures in workplace or society. Both Vanessa and Dr Rogers spoke from experience about calling out deprecating views of women who return to work after having children and Professor Sawer spoke about the need to build succession plans so the flow of women leaders and institutional feminist policy in politics and society is maintained. Each of the panelists shared their final thoughts on progressing equality after the conference; Corporal Power advised us all to stand up and make our voices heard, Professor Sawer encouraged us to start building personal and professional alliances, Dr Rogers asked us to think about “who is not in the room” and to make noise when diverse women are excluded and Vanessa encouraged us to use purchasing power to abandon companies whose workplace practices dismiss women. You could forgive the room for being exhausted at the end of all that, but She Leads amped it up for our last speaker of the day, HESTA’s Head of Impact Mary Delahunty who really should come with a “hazardous amounts of laughing” warning. She gave credit to the women who preceded us, reminded us all that we are nothing without the collective and spoke about the exhaustion that comes with being a mum, cat-owner, superannuation guru and local councillor. 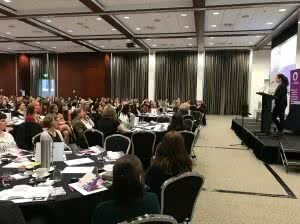 The audience ignored her advice to avoid talking superannuation, lest our eyes glaze over, but you can’t stop women on a mission and we were soon picking her brains about the policy deficits affecting women’s superannuation, bringing an end to a jam-packed day. Thank you to all our speakers, panelists and attendees. We are incredibly grateful for your engagement and feedback and we hope this year’s She Leads has given new insight into old problems, enabled networks to disrupt the status quo and encouraged you to identify talent and lift up women around you, because we only Rise as a collective by growing powerful together. Scholarship partners: ACT Government, Zonta Club of Canberra, and National Council of Women and personal donations from the family of Jacq Burridge, as well as Betty Ferguson and Fiona Jolley.